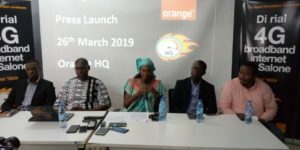 Orange Telecommunication, one of the leading GSM providers in Sierra Leone, has disclosed to the press that they will today Wednesday, March 27th, officially launch their 4G broadband internet service. Speaking during a presser at their IMATT Head Office in Freetown, Chief Executive Officer (CEO) of Orange, Aminata Kane Ndiaye, said they were aware that they were not the first company to launch 4G broadband internet services in the country, but that they have the real, fast and affordable 4G broadband. She said the launch of 4G was a continuation of their digital revolution they launched on 19th of February, 2019, adding that the company is in the country with a long term project that will lead to significant investment to cover most of the population in the country with voice, digital and financial services. She disclosed that since they started operations in the country in 2016, they have invested in excess of 55 million United States Dollars on the modernization and expansion of their network, a development she said has led to the construction of 94 new sites across the country and the connection of 925 new localities with hundreds of Sierra Leoneans now accessing data and voice services for the first time. She said Orange was the first company that has built more pole sites across Sierra Leone , adding that they have plans to have over sixty pole sites in Freetown and to also build fifty pole sites across the country, with the aim of strengthening their network cover 80% of the country and make communication easier for their customers. She said the launch of the 4G will complement the launch of Orange digital revolution that was launched in February, 2019, which saw the reduction of data prices by 50%. She added that the 4G is truly high-speed broadband mobile internet and an unmatched life changing experience that puts digital communication completely within the customer’s control. She said as a company servicing the people, they always listen to the complaint of their customers, noting that they had first increased their data bundles as demanded by their customers and now launching their 4G broadband internet service to further please their customers. She further that they are not only operating in the country for profit making, but to also give back to the people of Sierra Leone through various programmes, noting that in 2018, they renovated and equipped two children labs at the Connaught Hospital. She said they were also supporting the government free quality education flagship programme, which according to her, was at the heart of the company.